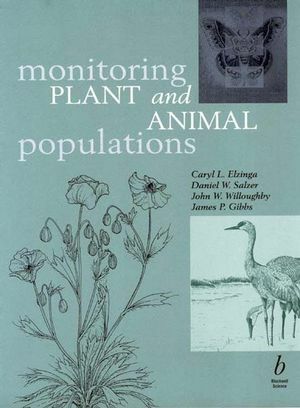 Monitoring Plant and Animal Populations offers an overview of population monitoring issues that is accessible to the typical field biologist and land managers with a modest statistical background. The text includes concrete guidelines for ecologists to follow to design a statistically defensible monitoring program. User-friendly, practical guide, written in a highly readable format. The authors provide an interdisciplinary scope to address the current, widespread interest in monitoring in many environmental fields, including pure and applied ecology, conservation biology, and wildlife management. Emphasizes the role of monitoring in adaptive management. Defines important terminology and contrasts monitoring with other data-collection activities. Covers the applicable principles of sampling and shows how to design a monitoring project. Provides a step-by-step overview of the monitoring process, illustrated by flow charts and references. The authors also offer guidelines for analyzing and interpreting monitoring data. Illustrates the foundation of management objectives and describes their components, types, and development. Describes common field techniques for measuring important attributes of animal and plant populations. Reviews different methods for recording monitoring data in the field, managing the data, and communicating data to policy makers. Caryl L. Elzinga and Daniel W. Salzer are the authors of Monitoring Plant and Animal Populations: A Handbook for Field Biologists, published by Wiley. 4. Qualitative Techniques For Monitoring. 6. Data Collection And Data Management. 7. Basic Principles Of Sampling. 12. Field Techniques For Measuring Vegetation. 13. Specialized Sampling Methods And Field Techniques For Animals. 15. Communication And Monitoring Plans. Appendix II: Sample Size Equations. Appendix III: Confidence Interval Equations. Appendix IV: Sample Size And Confidence Intervals For Complex Sampling Designs.